Other photos: Dock Profile 2, Stern, Triple 350 Yamahas, Cockpit, Dive Door Closed, Dive Door Open, Cockpit Forward, Pull-Out Frigid Rigid Cooler, Refrigerator, Helm Deck Seating, Port Seating, Co-Captain Chair, Swiverl Seat, Garmin MFD, Stbd Seating, Stbd Seating (Helm Converted), Helm, Electronics, Cabin, Cabin, Forward Berth, Galley with TV, Dinette that Converts to Berth, Cabin Aft, Fridge and Freezer, Head, Head 2, Custom Shower with Seat, Bow, Diamond Stitched Sun Pad, Spotlight and FLIR, SAT TV and Garmin Radar, Factory Sea Trail (No Bottom Paint; Lighter Load), Photo 34. This is a fully-loaded Intrepid 410 Evolution that has been lightly used and kept under cover in dry storage. Her triple white F350 Yamahas have 200hrs, just had a service completed, and are under warranty until 2022. 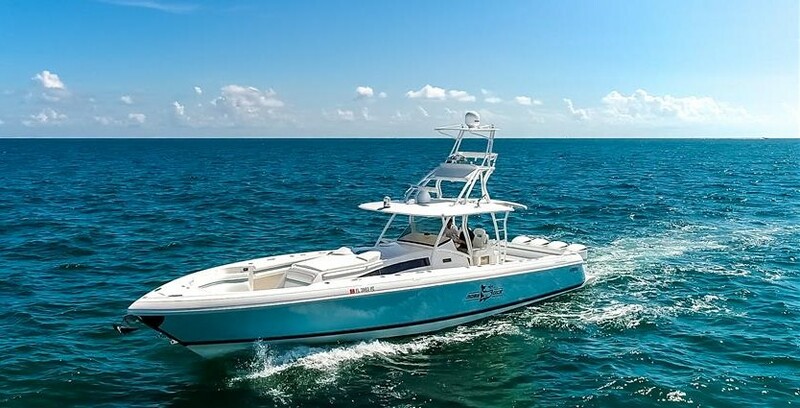 She is the perfect day-boat for fishing, cruising, and exploring the Bahamas in total comfort with a 40mph cruise and enclosed, air-conditioned helm deck. Considering the condition and extensive upgrades, this is the best 410 Evolution on the market. Her owner has purchased a larger vessel and does not want to continue being a two-boat owner. Call or text the listing agent anytime to schedule a showing --- the boat is easy to see near the Ft. Lauderdale Airport.